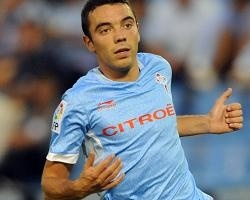 Valencia CF: Iago Aspas signs for Valencia CF? Iago Aspas signs for Valencia CF? Has Iago Aspas signed for Valencia CF? Fran Guaita has claimed the deal is done, though not yet with Celta. From various sources it seems like Iago Aspas has signed or is very close to signing a personal agreement with Valencia CF. Supposedly (from some sources) all the details have been worked out, and in the personal agreement Iago Aspas would become a Valencia CF player for 5 years. Supposedly Valencia CF want to reach the buy-out clause of the player. I'm actually positive that a deal has been made, I knew for a fact that Valencia CF was/had signed 2 players, I've reported this numerous times for at least a month now, but didn't knew exactly who the players are going to be! I'm in the forum as well explaining this. Even more important here is that Antonio Sese one of the officials at Valencia CF announced through his twitter account that Valencia CF in the coming period would sign a big player, someone that "would restore the fans faith in the club". So Iago Aspas is a big name, at least for Valencia CF, certainly one of the great up and coming players, some big clubs were interested in him, reportedly Chelsea FC was interested in him. So from my sources, from what I'm reading and from what I know and can asses the deal with the player has most likely been made, although I believe there is still ways to go until Valencia CF reach and agreement with Celta over the transfer of Iago Aspas, though most likely Valencia CF are going to pay the buy-out clause or come to an agreement to pay less than 10 million in order to avoid paying big taxes to the government, but put in big bonuses to be payed to Celta for sporting stuff. For example if Iago scores 20 goals they would need to pay Celta say 1 million, if he plays 40 matches they would need to pay 1 million more and that type of deal. That is what Valencia CF is negotiating right now, though we'll see what will happen.